Youtube user, PlymouthAfterHours1, is an avid local ghost hunter. We were deeply disappointed to learn that members of a university fraternity had planned an offensive themed party for November. The language of the invitation and theme of the party denigrated all women and African American/black identified people through racial stereotypes and cultural appropriation. 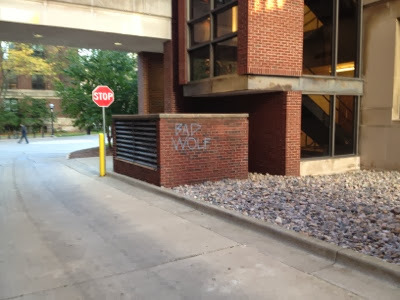 This behavior is offensive, disrespectful and unacceptable at the University of Michigan. It is unhealthy and harms everyone in the community. It is in direct contradiction to the values, policies and expectations of the University and will not be tolerated. Disturbingly, negative stereotypes and misogynistic behavior are woven into popular culture today. We believe this reinforces the ongoing need to continually pay attention to diversity and engage in thoughtful, challenging conversations about social identities. It's nice to know the University's response was so prompt and thoughtful. What do you call the night before Halloween? 1) Seems like a lot of folks in Southeast Michigan "have no word for this night." I wonder if this reflects people identifying where they live as "not Detroit." 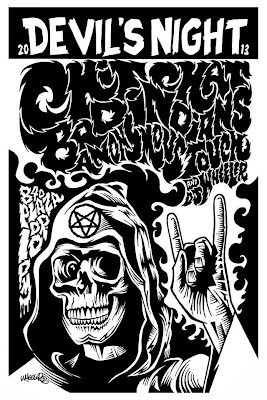 eg We're so not Detroit, we don't even have a word for Devil's Night here. 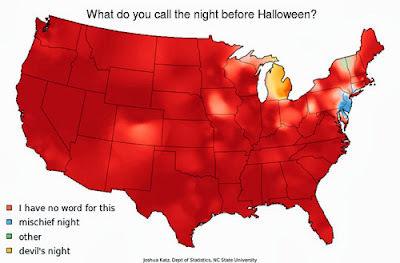 2) Common New Jersey, "Mischief Night?" Get serious. 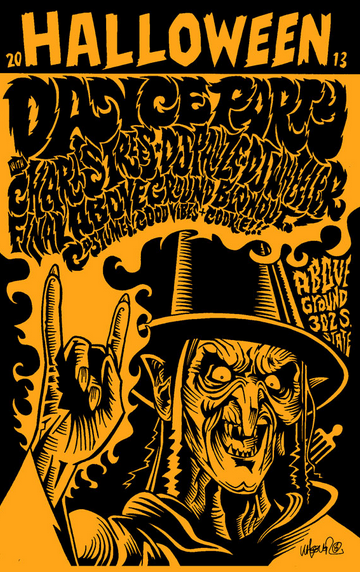 Aboveground Studio is having one final blowout before they close. Is there any better way to go than a Halloween dance party? I have no idea when it starts, or what cover is, but Charles Trees and Jeremy Wheeler, DJ will be there. You may or may not know, but we here at Damn Arbor are trying to help get out the vote for Tuesday's election. 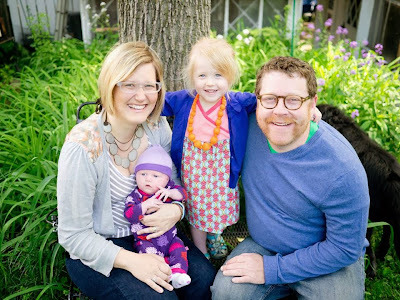 I'm wondering if you might be interested in doing a short interview with us over email. If you are, drop us a line: damn.arbor@gmail.com. 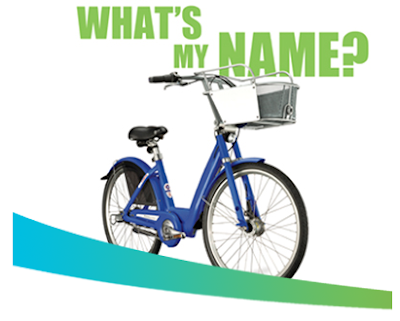 Ann Arbor's new shared bikes need a name. Do you have any ideas? The winnings submission get's a free year membership. Will Ann Arbor end up like that town in Alaska with a cat as a mayor? Will the Twenty Pound Carp vote take away from the Admiral Ackbar vote? Dearest Ann Arbor. 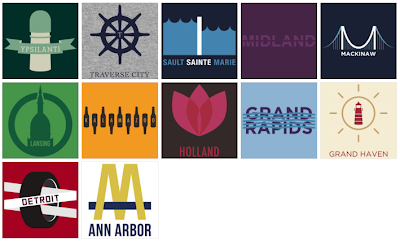 I have been in mourning since the personal loss of AnnArbor.com. I am struggling to mlive my life to the fullest. Anyways, I have to write my review before the next rerun of Lawrence Welk. I am known among my gal friends as being dedicated to my art! My closest home girls know that for almost two decades I raised a Chia Pet like my own daughter. In its later years it started to chew through the power cords of my television. I cried when I had to shave away the green hair of my Chia Pet and use it as a paper weight. Anywho, back to the pumpkins. Every year I make a series of pumpkins that explore my postmenopausal years. Hot flashes were the first theme, in fact, they were the theme during my menopause. Each child that I babysit makes a pumpkin with a symptom (chills, sweats, rapid heartbeat). They were truly beautiful things, we couldn't have crafted them better if I was menstruating! However, as soon the orange goddesses were placed on my doorstep, they disappeared in a (hot) flash! The first year the pumpkin thief hid the pumpkins behind my car wheels! It was truly a genius plan, because I became responsible for their demise, poor me. I remember clutching the remains of pumpkin seeds while screaming to the sky. 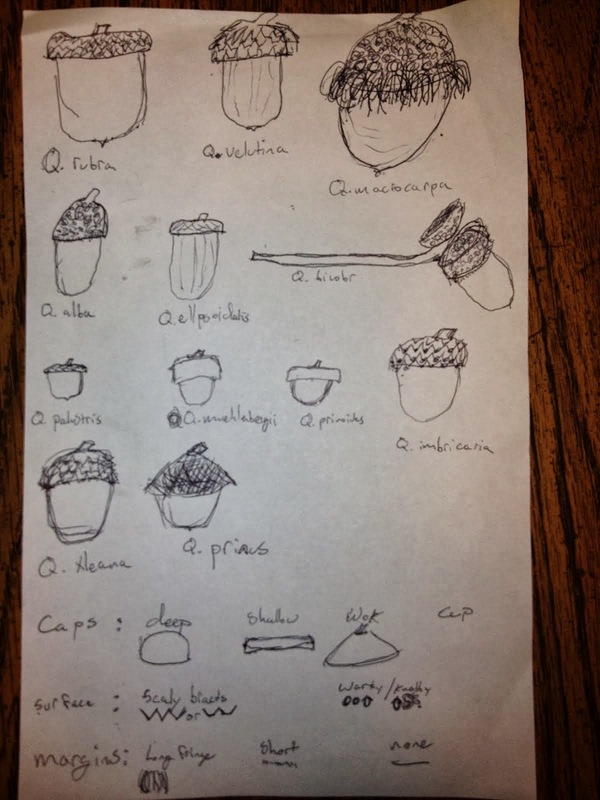 The second year (the theme was migranes) there was no indication of my pumpkins for days. Finally, a serious of packages showed back up at my door. Inside were the remains of my pumpkins, blended down and put into a pie pan along with a series of photos of the cast of Party Of Five. Over the years, gosh darnit, I have come to expect that my pumpkins will be taken, but do you think I give up? NO! I have found my pumpkins in the toilet bowl at work, hidden in the background of several popular Bollywood films, and I suspect that they are being used at Festifools due to the fact that they often resemble prominent Ann Arborites having menopausal joint pain. This year the pumpkins stolen illustrated the all too real 'urinary urgency.' They were very therapeutic to make and I would like them back in hopefully one or two pieces. If you are the people who hide my pumpkins, please think about returning them to a nice older neighbor, with only some minor misdemeanors. Do not return pumpkins that have been soaked in alcohol, they are a fire hazard. Please tune in next week for my article on that cobblestone street in Kerrytown. "The combination of music, deeply shadowed visuals, and slow, tense pace make this little production far more effective than any single big-budget adaptation of Lovecraft's work." "A beautiful psychological mood piece that one quickly ends up comparing with the work of Val Lewton"
H.P. Lovecraft's The Hound (1997) from Anthony Penta on Vimeo. Will we see a "Stand Your Ground" defense in the Rush St. Shooting? "An altercation followed and Finneren took out his pistol and fired two shots", police said. An investigation may reveal that Finneren was merely standing his ground. (a) The individual honestly and reasonably believes that the use of deadly force is necessary to prevent the imminent death of or imminent great bodily harm to himself or herself or to another individual. (b) The individual honestly and reasonably believes that the use of deadly force is necessary to prevent the imminent sexual assault of himself or herself or of another individual. History: 2006, Act 309, Eff. Oct. 1, 2006. Police said Monday Finneren was confronted by the Illinois man and other men after Finneren was making aggressive advances toward a woman in their group. 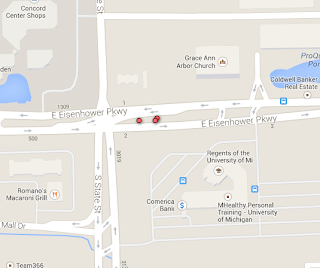 An altercation followed and Finneren took out his pistol and fired two shots, police said. The "Stand Your Ground" argument seems to turn on whether Finneren was in commission of a crime at the time of the shooting. In Michigan it is illegal to cary your firearm into an establishment that primarily serves alcohol. Thanks to two off duty paramedics, who were celebrating a birthday at Rush St. and the quick response of local first responders, the victim is in critical but stable condition. 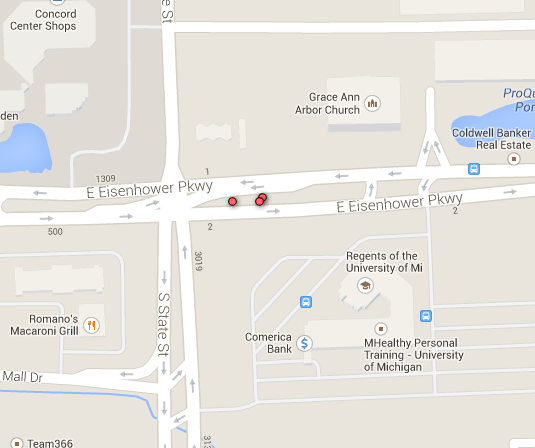 It is also fortunate that nobody at Rush St. was more seriously injured in the events on the morning of October 27th. Hopefully, this will fly under the radar of the national media and we can get on living our lives and avoiding Rush St. Gentle Readers, as you know I am fairly interested in Ann Arbor City Politics. I am curious though, about you. Do you plan on voting in the upcoming election? What local issues are important to you? 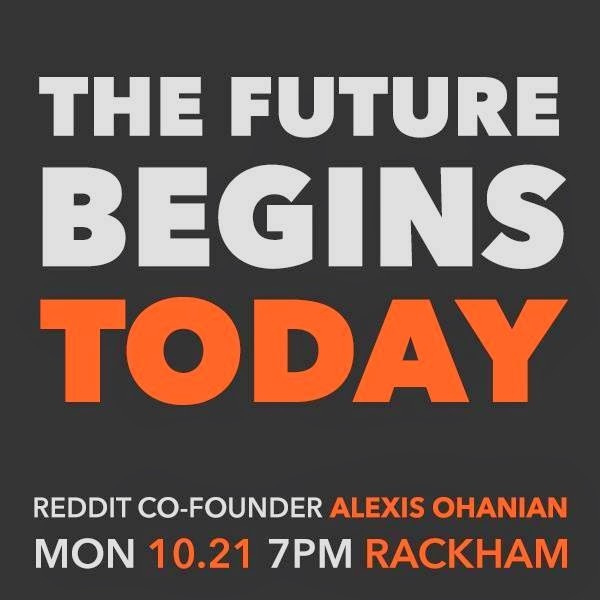 Also, I'm wondering what questions you would ask our current City Council candidates. Though it's late in the election cycle, I'm planning on trying to set up some last minute (online) interviews with any interested candidates. I'm interested in knowing what you would want to ask them. Jack Eaton - Democrat: $9,200 William Lockwood - Mystery Write-In Candidate: ? Chip Smith - Democrat, Write-in Challenger: less than $1,000 Thomas Partridge - Write-in Challenger: ? If you want to see maps of where folks contributions have come from, make sure you check out the Chronicle's article. All in all, donations total more than $50,000. Based on donations, it seems as though the Ward 2 race is the most highly contested with more than $30,000. 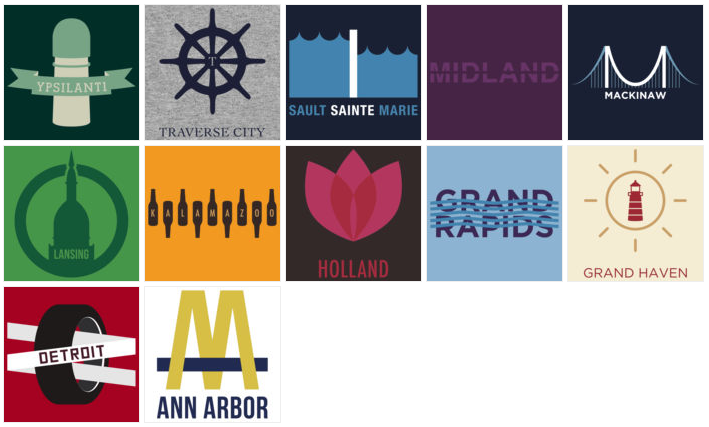 What do you spend that on for a race in Ann Arbor? It's not like we have a local TV market. It would be interesting to see local campaign commercials though. Do donations mirror public support? Will they predict the outcome of the election? In the Ward 2 race, will Conrad Brown pull votes from CM Lumm, or from Kirk Westphal? Will he be able to pull a significant amount of votes? Gentle readers, do you plan to vote in the election next Tuesday? What are the important issues for you? Instagraming the post-shooting aftermath on Main St.
Local musician, Keri Lynn Roche, was outside of Rush St. last night and managed to capture an Instagram of the alleged shooter being taken in by the AAPD. You can read more from the dot News. I've never been to Rush St. but I imagine that this isn't normal for the place? Checkout this picture of Wolverine, Tom Harmon from 1936. It was posted to r/colorization and r/uofm. Pretty cool. Go Blue! When elected, I will also offer residents a chance to make a DDA member of their choice dress up and dance like an organ grinder's monkey. Election 2013 is starting to heat up. Tonight and tomorrow local historian, James Mann will be giving lantern lit tours of Ypsilanti's Highland Cemetery. The tours start at 7pm and cost $5. On the tour you will learn about the history of the cemetery and it's residents. Sounds spooky. 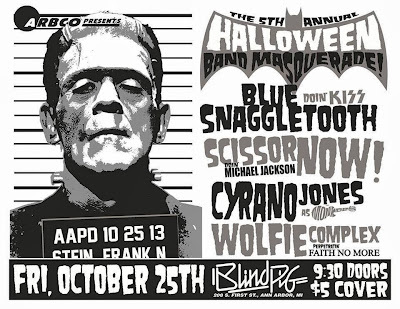 This Saturday, the Blind Pig is hosting the ever spooky Bang! Wear your best costume or find something in the dumpster out back. Whatever you do, don't appropriate other cultures this Halloween. Gentle readers, as you know, I support Ann Arbor's current pedestrian safety ordinance. 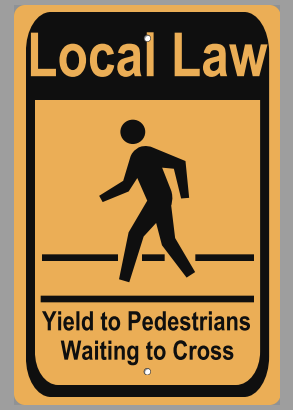 It requires that drivers yield to pedestrians waiting to cross at marked crosswalks. This is not to say improvements in the execution are not needed. 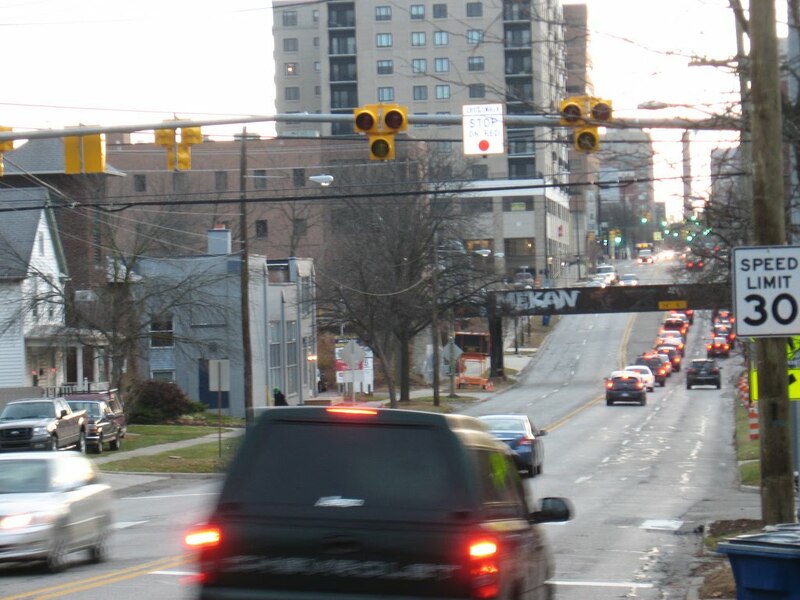 Personally, I would like to see better ways to communicate the law to commuters, out of towners and new residents. 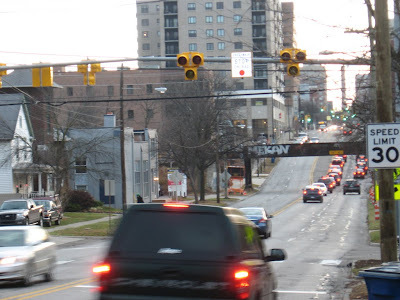 Specifically, I think we need large, clear and concise signage at the main arteries into Ann Arbor, and before and at busy crosswalks. Also, I think we need something more in the style of HAWK Walks rather than RRFBs for crosswalks that cross 4 lane roads. The RRFBs seem good for crosswalks on busy 2 lane roads. Despite the shortfalling in the execution of the ordinance, I think it is a good step in increasing walkability. Currently, forces are mustering to mount an effort to repeal the ordinance. If you feel as I do, I encourage you to sign this petition over on change.org. I don't always sign online petitions, but when I do, they are in support of walkability issues. The poster pretty much says it all. One example why I'm waging this quixotic campaign is because Councilman Anglin continues to do things like vote against allocating $280,000 to replace the failing light poles on Main Street to go with $300k from the DDA. The vote is so alarming because Anglin was part of the group that directed the DDA to come up with $300,000 for the project during budget talks last spring. He, along with the other council folks who voted against this measure knew that because they directed the DDA to dedicate $300k to affordable housing that there would be a request for general fund dollars to pay for the balance of this project. Unfortunately, I can't figure out Chip's last name. A risky move for sure for a write-in candidate. Apparently I can't read good. This should surprise none of you. Smith, Chip's last name is Smith. This election is quickly shaping up to be much more interesting than I would have anticipated just a few months ago. Anyone know the scuttlebutt on Chip? @juliewbee, @mariahc, this one goes out to you and all of our other dedicated readers who are librarians. Spotted this plate yesterday in the Church St. Structure. Sherman Ave posted an article today relating the Big Ten to Parks and Rec characters. Now, those who follow the show know that two weeks ago we were introduced to Pawnee's Eagleton Doppelgängers. This list is not as good as that episode, but it is a relief because Parks is not returning till November. I am so proud that we were cast as Ron Swanson, however, Donna is not even on this list. This is most likely because no one can compare to the greatness of Donna. So, do you think we were paired right? I am not sure if Ron would even like Ann Arbor. Sorry for all the links, but I think everyone should be exposed to this show constantly. Gentle readers, there are puppies on the Diag right now. If you're feeling down, you can go and pet them. But hurry, these highly trained therapy dogs are only on the Diag until 1 pm. 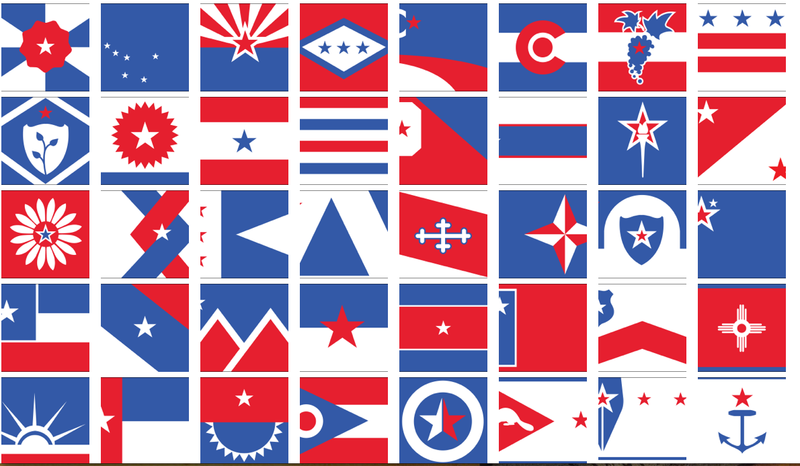 Ed Mitchell, a designer at Philadelphia-based Bresslergroup has come up with a complete set of new state flags that use a unified color pallet and symbology. Not too long ago I heard a radio piece about a city flag. Curiosity led me down the path to our state flags. I was immediately bothered by how discordant they are as a group, and I wasn’t surprised to learn they break just about every rule of flag design. 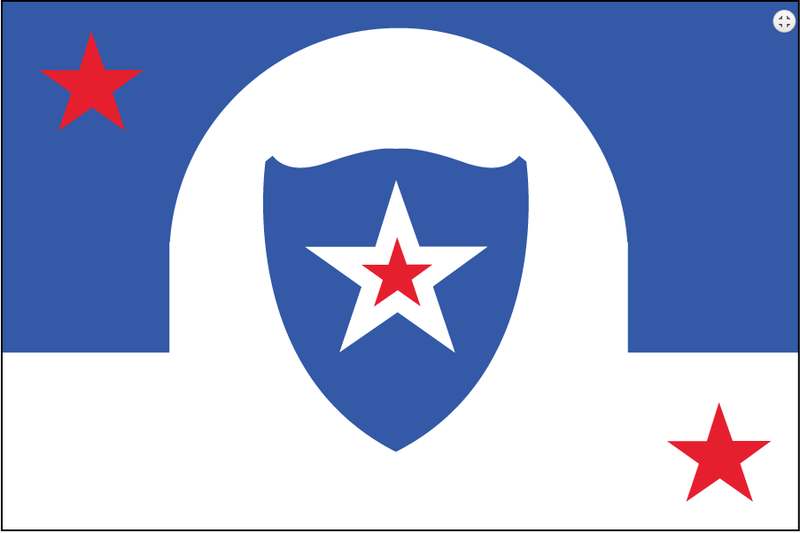 (More on the official rules of flag design later.) When you look at them all together, there’s no indication they come from the same nation. Gone are the chaotic array of old state symbols and divisive symbols of the past. In their place we find stars, lots and lots of stars and a brightened up shades of red and blue. 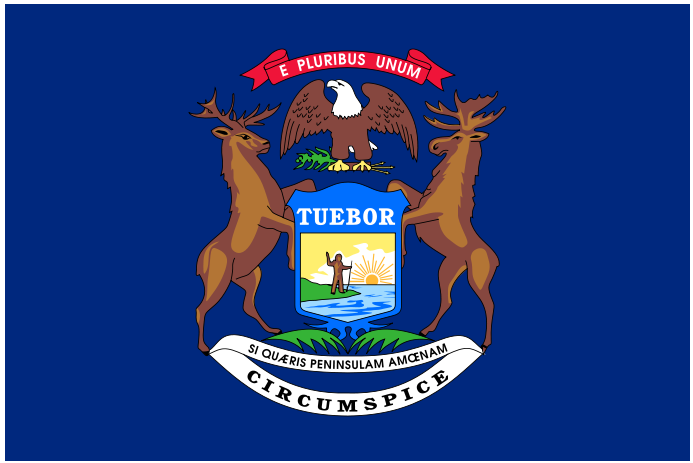 You can see Michigan's new (painfully bland) flag below. This flag just doesn't do it for me. Without the description, it's impossible to know that it represents Michigan. 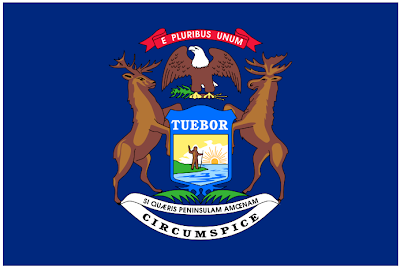 It also lacks my favorite feature of the flag of Michigan: the sasquatch walking along the lake shore with a walking stick. You can check out an array of flags below and try to guess which represents each state. I guess if you escape from the cops once in an evening, maybe it's best to call it a night, rather than continuing your crime drinking spree. We're going to be on C-Span! Tomorrow @ 2:30pm, C-Span will be at the store! If you're not doing anything, come to the store around 2:15! C-Span is coming to Ann Arbor's newest bookstore tomorrow. Pretty cool. Tonight's city council meeting promises to be exciting, well at least as far as city council meetings go. All of the most controversial topics are coming up in one single meeting: a motion to reconsider the appointment of Al McWilliams to the DDA; a motion to approve the contract for an environmental assessment for the new Ann Arbor Train Station. And though it's not on the agenda, I imaging there will be some communication about the effort to repeal the Crosswalk Ordinance. 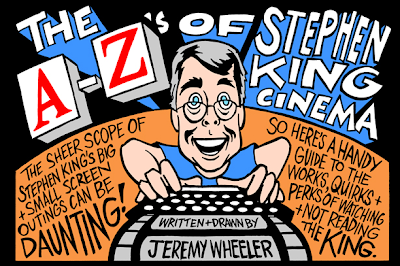 For more information, check out previews from the Ann Arbor Chronicle and Ed Vielmetti. You can follow the meeting on CTN, the Chronicle's live text updates and the #a2council hashtag on the twitter. Also, the full agenda is on the city's website. The Michigan Daily posted this photo earlier of a bus failing to turn. Personally, it looks like some god threw the bus down in anger. If you're looking for some large wooden boxes, there's a large collection of them between the Dana Building and Randall Lab. 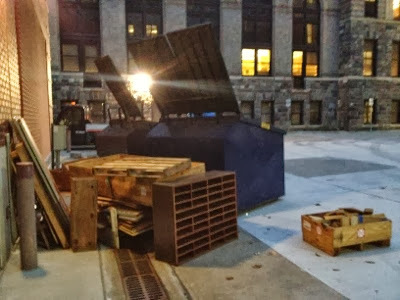 It looks like some lab equipment was shipped in the boxes and now they are being tossed out. From past experience, I can tell you these are great for making raised beads. Perhaps a trip to Literati today? I stopped by Literati yesterday and Hillary, the owner, let me in on a great secret: the place is dead during home football games. Apparently the same is true for ABC as well. On top of that, there is even on street parking available. Or so they say. So if you're not watching the game today, why not check out Literati and/or stop for a pint at ABC? Also, this football Saturday, there is a special event at Literati: Newbery Medal winning author of Shiloh, Phyllis Reynolds Naylor, will be there at 4:00. 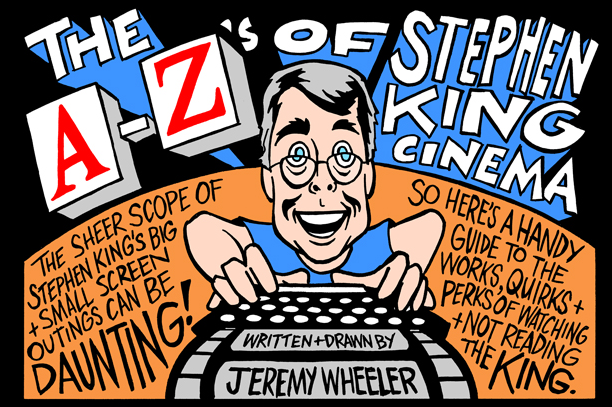 Ann Arbor's very own Jeremy Wheeler has a cartoon in Esquire. It's great to see a local kid making it big on the national scene. Someone in Windsor has reshaped one of the city's riverside topiaries. How many puns can you find in the above news clip? Food carts are coming to South U. 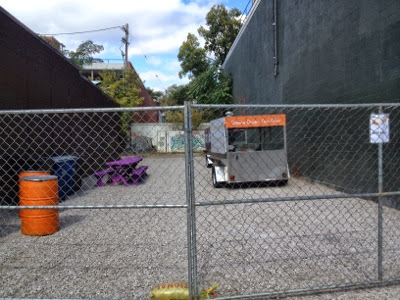 Mark's Carts veterans Alex Perlman and Noah Hoffman have signed a short term lease for the vacant lot that was left after Pinball Pete's Annex burnt down in 2009. According to the Com The .News, the details are still being hammered out. But as of yesterday, it looked like at least the Cheese Dream cart was parked there. Given the density of students in the area looking for late night eats, Eat the Hub seems like a brilliant idea. Saw this sweet bike by Randall Lab yesterday. I really like the bag and the saddle. But what really caught my eye was the Sheldon Brown sticker. I was thinking about the Apple Orchard, and I was thinking about the Apples on Eisenhower. A while ago, I posted about Falling Fruit.org. This site can be used to forage all around town and has been updated quite a bunch since spring. 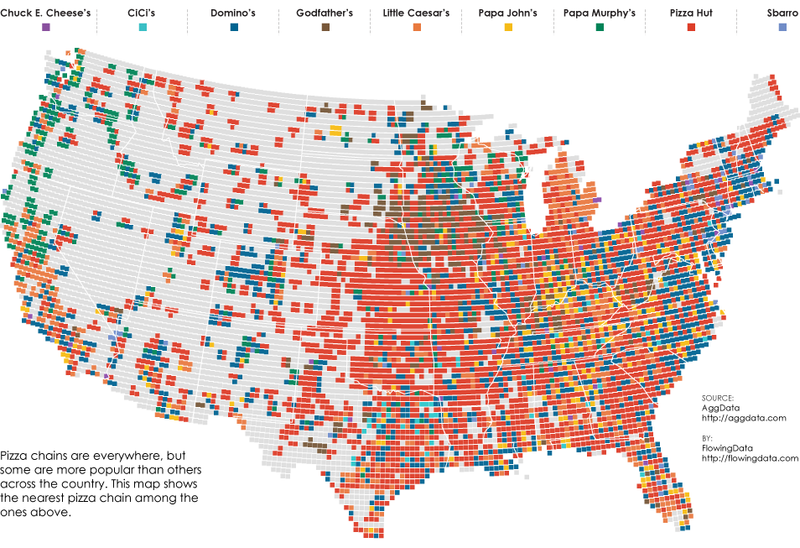 FlowingData has made a pretty cool map that shows nearest major pizza chain across the US. 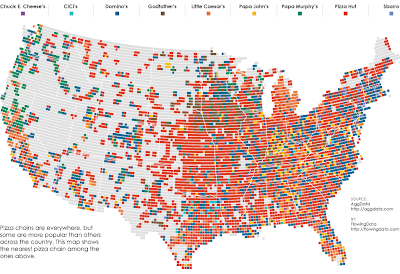 Michigan is pretty clearly the territory of Little Caesar's save for some Pizza Hut in the west and a few blips of Domino's. I guess I could've called this article 'Dr. Strange Court Or How I Learned to Stop Worrying and Love the "Post Racial America."' Today, the Supreme Court is hearing arguments about whether or not voters are able to institute a ban on Affirmative Action. This is the second time that a Michigan case regarding affirmative action has been seen by the Supreme Court. In 2003, the court, albeit divided, upheld affirmative action at the university level. However, in 2006, Michigan voters banned affirmative action in public education through an amendment to our state constitution. The Court has already seen one case on this issue this year, throwing the case of Abigail Fisher back to Texas to get more evidence or something. Unfortunately, most believe that the court will sustain the ban on affirmative action. If you'd like to read more and are sick of search engines, then I have gathered some articles for you. By the way, we are not a post racial America. Oh readers, it has been a long time. 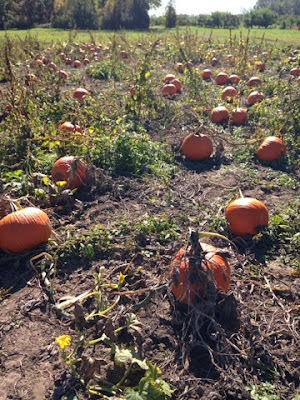 I have been pretty busy, but on saturday, before I had to do real people things, I got to go apple and pumpkin picking. While Halloween is my favorite holiday, I have neglected some aspects of it during my stay in Ann Arbor-- like pumpkin carving. I went to Wiard's on Saturday to pick some pumpkins. I had been there before for Night Terrors, and it was scary (but I am a wimp). Anyways, I was disappointed by the exorbitant fees so I made a face like a malformed Jack-O-Lantern and left. Well, it turns out, I am resilient when it comes to menial tasks and ventured to Wasem's. It was like the golden age of U-Pick. They let you venture freely to pick, in contrast to Wiards, and thus I was in apple heaven. The pumpkins were beautiful and only one fell apart when I touched it. My personal recommendation, if anyone is venturing out for a day trip, is to make it over to Wasem's this fall season. 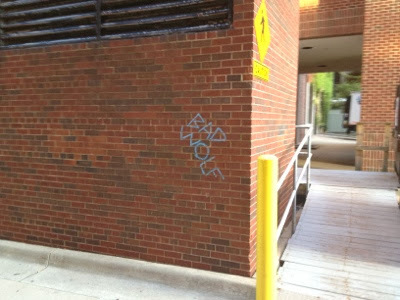 Looks like some Doctor Who fans chalked the Dennison and CC Little buildings. 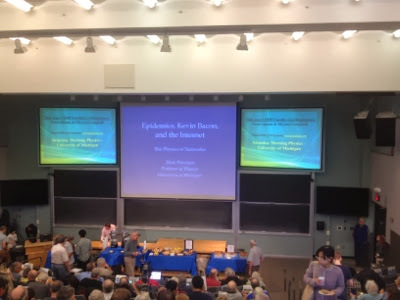 I went to my first Saturday Morning Physics today. The presentation was on network theory and social networks. It was pretty good. Next week's lecture is on fracking and promises to be illuminating. For my two cents, I'll suggest using Quercus macrocarpa (bur oak) acorns. They are large and in the white oak sect, so they have fewer tannins. 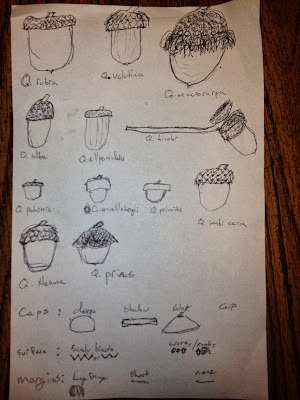 Once you have your flower all ground and dried, why not try making some Acorn Maple Shortbread Cookies? Who wants to move to the Cube? I really, really, really messed up. Check out this Free Press video for a quick-and-dirty on Mr. Kilpatrick's political scandals. Beloved local musician, puppeteer and former Wikipedia page-haver, Patrick Elikns has some steep medical bills he's unable to pay. MarkMaynard and some of Patrick's other friends have banded together to throw Legfest, a fundraising concert for Mr. Elkins. It is tomorrow night at Woodruff's. It should be awesome. Saw this prominently displayed Stars and Bars on Forest and Hill St. My question is: why? Seems like if you were going for a symbol of southern pride, you could just whip up a big ol' pitcher of sweet tea. Gentle reader, perhaps you've noticed I've been remiss on updating Damn Arbor. I apologize. I spent the weekend fishing the salmon run up on the Manistee River. Don't worry, a longer post on the subject is forthcoming. It's not quite Trout Fishing in Yemen, but it'll be pretty great. 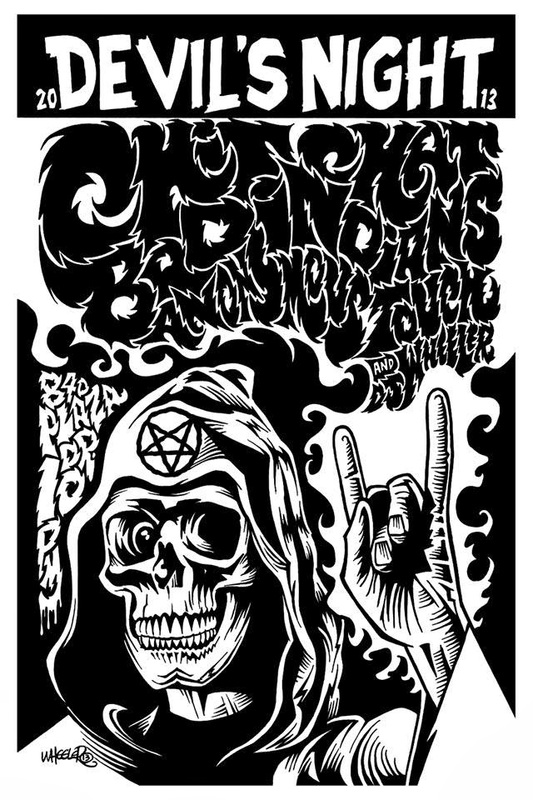 Tomorrow the show's at the Music Hall in Detroit. The theme is "Apocalyptical." Can't wait! 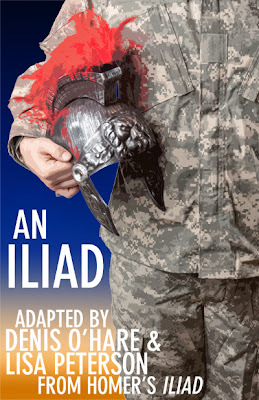 John Manfredi sweats through his shirt "singing" the classic Trojan War story in the Performance Network Theatre's production of "An Iliad" by Lisa Peterson and Denis O'Hare. With excellence; that is the sweat of excellence. 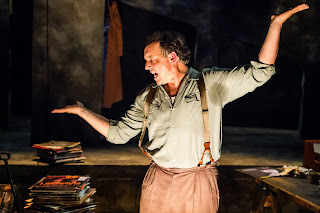 Mr. Manfredi is exactly the man to play the role of the haggard, war-weary, long-suffering poet, warning yet another generation, another time, another place, another people, again and again, over and over and over since the beginning and until the end of time, of the pains of war. Craggy-faced and sweet-voiced--really, the kind of voice you want to hear read the news, the morning announcements, the phonebook, anything--Mr. Manfredi commands the stage and the narrative without pandering to the audience or leaving it behind. He is Achilles and he is Hector, he is Kings Priam and Agamemnon, he is Andromache and Helen and Paris and Patroclus. But he is most thrilling when he is the poet--part high school teacher, part social commenter--speaking softly and confidentially, or raging around the stage sticking invisible swords in invisible soldiers, or changing the record player, smiling to himself over the fresh delight he has in store for his audience. What he's doing is good old-fashioned story-telling, and you just can't go wrong entrusting your evening in Mr. Manfredi's very capable hands. Perhaps it is heresy to say, but I did not find the material itself especially compelling. Ridiculous, I know: this is a retelling of one of the oldest, most persistent stories in the Western world. The tragically heroic Achilles, the deeply good Hector, the beautiful Helen (that whore, says the poet), the broken-hearted Andromache--these are the memes we've been aping for millennia. It is the very stuff of good story, as we understand it. For me, that was the problem. If you're going to re-imagine the Iliad, I want to see more imagining. This sometimes felt like a high production classic lit lesson that skips over some of the juiciest stuff in the source material. The novel contribution was the comparison of the Trojan War to every Western war that has happened since, culminating in an actual listing of all these conflicts. Don't get me wrong: you can't go wrong with the Iliad, and, worst case scenario, this an enjoyable reminder of a tale you once read in school. I just sometimes found myself wondering, Why? What is the purpose of this adaptation? If the answer is, "To give Mr. Manfredi in Ann Arbor a vessel to disseminate his gifts as an actor," that would be reason enough for me. Sleepy Holler has been a Damn Arbor favorite for a while now--it's the perfect soundtrack to the crispening of the air and the donning of the sweaters. (Come on, air: crispen! Crispen!) Their debut album is now for sale on iTunes! "Distances" has been haunting my ear buds so far this year. If you're looking for a nice place to get away this weekend, or maybe interested in taking in the seasons colors, you should think about checking out Haven Hill in the Highland Recreation Area. It's about a 45 minute drive (north on 23, east on M 59), but it is one of the nicest hikes I know of in the area. In this present-day retelling of Homer’s classic, a lone figure appears on an unadorned stage and shares the tragic narrative he is fated to tell for eternity. 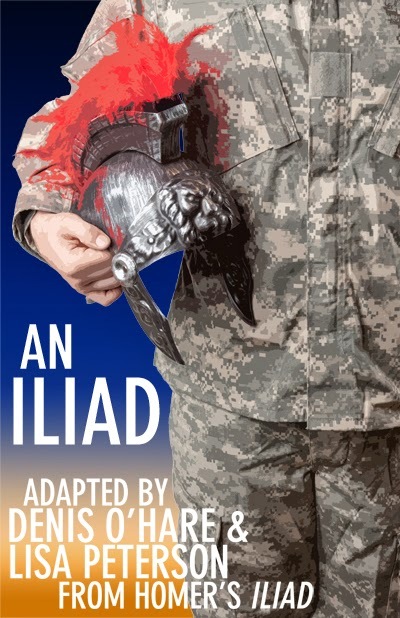 This epic narrative brings humor, pathos, and excitement to the ancient tale of the Trojan War, colliding it with the contemporary world and creating a wholly captivating theatrical experience. Starring John Manfredi. Sounds pretty good. We have a review forthcoming. Stay tuned. Shows are Thursday 7:30pm, Friday-Saturday 8pm, Saturday 3pm, Sunday 2pm. Tickets are $22 to $41 and active military personnel and veterans get a $20 discount. Tonight, come celebrate Violin Monster's 493rd birthday at Corner Brewery. 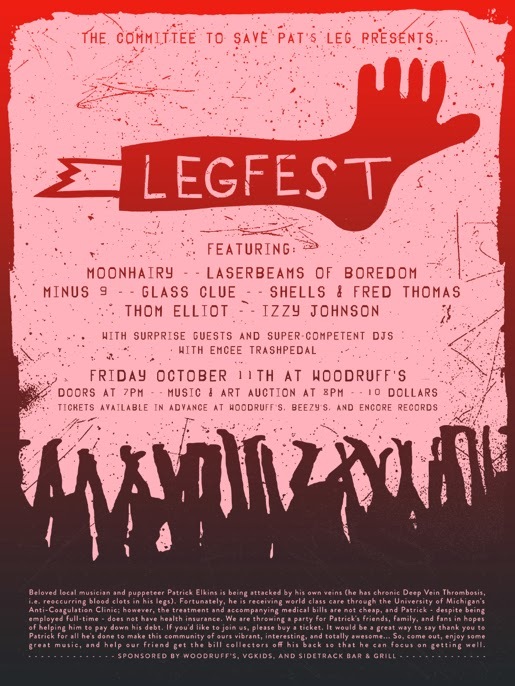 There will be live music and a chance to try Violin Monster Autumn Ale. If you haven't had a chance to sample it, I highly recommend it. It's a rich dark wheat ale flavored with autumn spices. At 9.5% abv, it packs quite a wallop. It is hands down the best fall seasonal I've had. Creatures of all kinds are welcome at the party, but humans are encouraged to wear costumes. Doors are at 6 and music starts at 7. A %5 donation to support the musicians is encouraged. David Lynch trolls Ann Arbor's missed connections? Is someone inspired by Welcome to Night Vale? That last line is poetry. "She is still one of my closest friends and I talk to her all the time even though she's only the left half of a human body."